We just love the smell of Mint leaves. Growing one’s own herbs is great as you’ll ensure that they are free of pesticides for good health. We have been planting Common Mint for several years in a pot at our kitchen garden at the backyard. Moreover, it’s so easy to plant them. Just buy a bunch of fresh and healthy-looking Mint leaves from the supermarket or grocery store. Then fill your pot with garden soil and thrust them about 2 cm deep into the soil and water them regularly. Simple right? We can’t do without the Common Mint with its wonderful aroma. 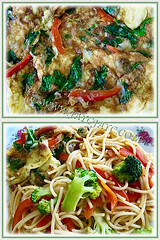 Love to add its leaves to egg omelette and spaghetti. 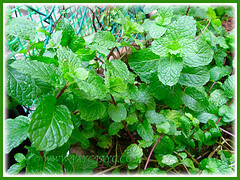 Common Name: Garden Mint, Common Mint, Spearmint, English Mint. Family name: Lamiaceae (Mint family). 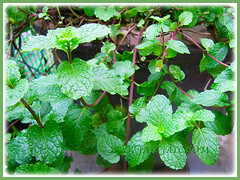 Etymology: The genus Mentha a Latin word is derived from the Greek word, Menthe, referring to a nymph who was transformed into a Mint plant. Origin: Native to Europe and Asia. Plant type: An aromatic spreading perennial herb. Features: Mentha spicata is a one of the most important commercial species belonging to the genus Mentha that consists of about 25 species and numerous hybrids and cultivars. A vigorous growing perennial herb with a low-growing, sprawling or trailing habit, spreading to between 30-90 cm via its stolons or runners. It is considered an invasive weed in some parts of the United States. The leaves are deep green and oval in shape with pointed ends and serrated margins. The leaves are oppositely arranged along the purplish branched stems and whorled at the top. The Garden Mint does produce small deep violet tubular flowers in slender spikes and clustered at the tip of a green or purple stems and tapering at the apex. The central spike may be flanked by one or more flowering stems. Flowers will be followed by tiny, round and brown seeds. 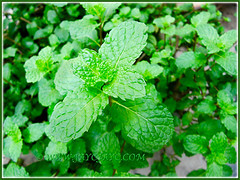 Unfortunately, we have not seen on our plants as our Mint leaves are frequently harvested. 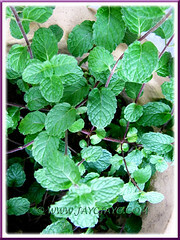 Culture (Care): Mentha spicata or Garden Mint grows easily with least maintenance. Others: Do snip sprigs and leaves as required to encourage new foliage and to prolong the harvest season. Fertilising is not needed. Generally free from serious garden pests and diseases. However, do watch out for infestation of spider mites, mealy bugs, rust and scales. It is deer resistant. For subtropical and temperate regions: Hardiness: USDA Zone 4 to 11. It is very cold hardy and tolerant of the heat, best up to Zone 11. It can be a ground cover. If pot grown, the long branches will grow upward and then flop over the pot. Keep the stems from touching the ground if you do not intend to root them. Best to grown Garden Mint in pots and locate them on patios or decks. Propagation: Best by stem cuttings. Can be propagated from seeds but may not have the characteristics of the parent plant. 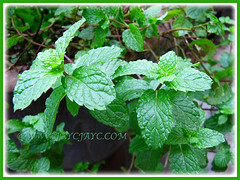 Usage: Mentha spicata or Spearmint with its unique flavour and aroma is used extensively in cuisines at home and restaurants to flavour food and tea. The leaves are often used in mint sauce. It provides a distinctive taste when added to garnish food such as lamb dishes, toothpastes and mouthwash products. It’s considered invasive, thus most ideal for container planting in pots and raised planters. Can be grown as a ground cover. It is used as a room deodoriser and for aromatherapy through the use of essential oils. 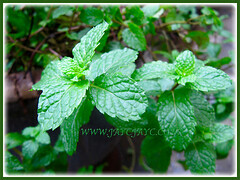 Sprinkle crush dried mint leaves in your garden as a natural insect repellent. 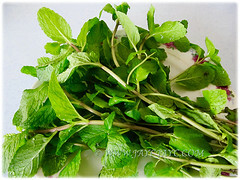 Also, the usage of Mint Leaf is well-known in traditional and modern medicine. Check it out at DesiMD Doctor to know more about the health benefits of Spearmint.